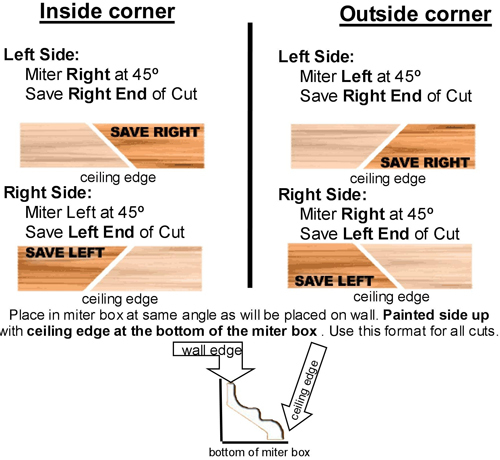 We offer pre-cut corners with each order; however should you need to cut a corner, don't worry. Cutting corners is easy if you take your time. Follow the diagram below to achieve the proper cuts. We recommend our miter saw, fitted with a special blade, to cleanly cut SoSimpleCrown moldings. Our crown molding can be painted before installation; it makes the job much easier. Other molding products must be painted after installation because they get damaged with hundreds of nail holes during the installation process. 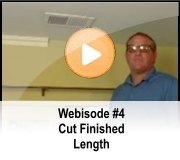 Our crown molding install with caulking; you don't have countless holes to repair. The above diagram is showing the crown molding being cut upside down.